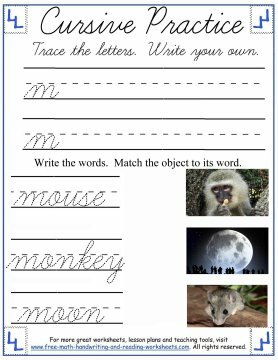 I have created several cursive worksheets and handwriting pages for all elementary ages from preschool to 5th Grade. Handwriting is sometimes thought of as a quick "extra" to be slipped into the daily class routine quickly. 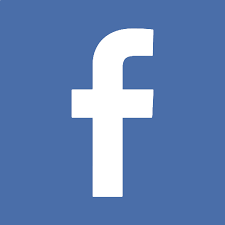 However, developing a legible hand is a skill that will serve your child well all through his or her life. Unfortunately, practicing cursive isn't the most fun task in the world. I try to make the worksheets fun and visually stimulating--you'll see lots of color and pictures. As a parent that uses these worksheets myself, I understand the urge to save on ink and print in grayscale. Yet, I believe that color is more stimulating to the child and provides a much better experience than filling out black and white practice pages all day. These lessons cover the lowercase letters 'm' through 'r'. For the rest of the alphabet see the lessons at the bottom of this page. 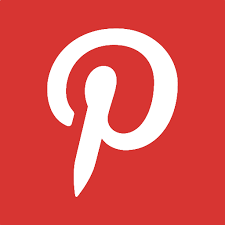 Click an image to open a printable file in another tab. 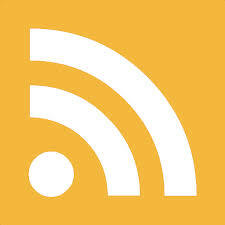 Each letter above is reinforced through a short activity. In the first paper, there are three pictures and three words. 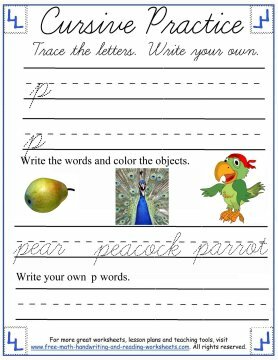 Have your child write the words and then draw a line from each word to the picture that it matches. Letter M and O both use this activity. The letter 'n' printout uses a simple word tracing activity at the bottom. You'll also find this short task at the bottom of the letter 'p' practice sheet, but with one exception. 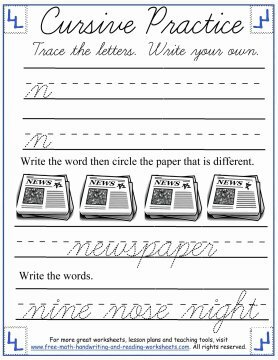 The second line is left blank for students to write their own words that begin with p. In addition to making children brainstorm words, they'll also have to write in cursive without tracing. 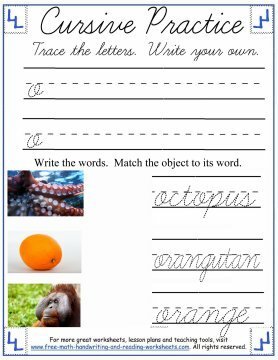 At the bottom of the 'Q' cursive practice page is a simple letter recognition activity. 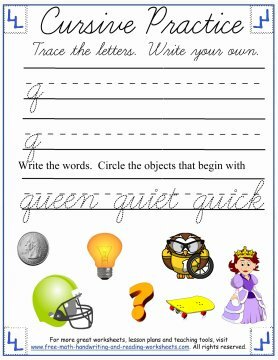 Your child needs to name each object and then circle the ones that begin with the letter q. The final handout eliminates tracing the words. There are two pictures shown and a word underneath each. 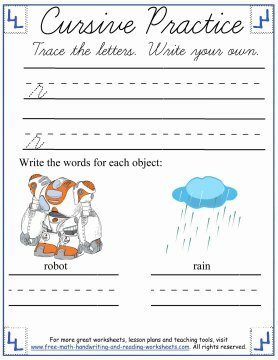 Have your child write the words.